The big headline from the Nielsen Q1 2018 Total Audience was that live television still dominates consumer viewing. A deeper look at the data shows that for half of US people traditional TV may not dominate at all. A cursory glance at the new Nielsen data certainly seems to confirm that live TV continues to dominate video consumption in the US. Nielsen says the average adult watched 4 hours 46 minutes of live and time-shifted TV in the first quarter of 2018. Online video through the PC, smartphone, streaming media player, and tablet contributed just 51 minutes more. Seeing this data, it would be easy to conclude that the world of television remains relatively unaffected by the digital assault of Netflix, YouTube, and Amazon. That would be a mistake. Older Americans heavily distort the average television viewing numbers. To understand why, let’s compare millennial video consumption to baby boomers, both of which represent about a quarter of the US population. We’ll use Nielsen’s grouping of 18-34-year-olds to approximate the millennials and 50-64-year-olds to represent the baby boomers. Baby boomers watched 6 hours 11 minutes of live+timeshifted TV each day while millennials watched almost 3-times less, 2 hours 17 minutes. 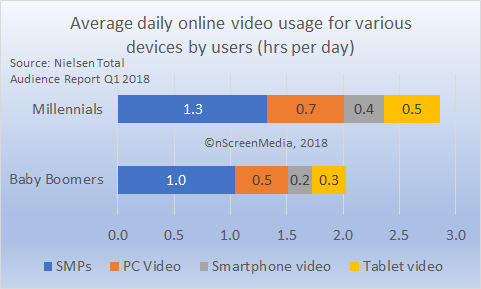 Conversely, millennials watched 1 hour 12 minutes a day on the PC, smartphone, streaming media player (SMP), and tablet, while baby boomers watched half as much. What’s more, teenagers watch less regular TV than millennials (1 hour 34 minutes per day) and kids under-12 watch about the same as millennials. In other words, two-thirds or more of the total time watching television in the US is being consumed by people over 34-years-old. So far, we have only looked at Nielsen’s average numbers for the whole population. These averages include both users and non-users of the specific medium. Looking at people that use their devices to watch video, the dominance of television becomes even shakier. Consider a millennial that watches live and time-shifted television, and watches video on a pc, smartphone, SMP, and tablet. Further, let’s assume our example millennial consumes the average amount of video on each of those devices. The millennial will watch a total of 5 hours 26 minutes per day of which 47% comes via live+timeshifted TV and 53% from digital sources. A baby boomer doing the same will consume 8 hours and 19 minutes of video per day of which three-quarters comes from traditional TV and a quarter from digital. Half the US population is 38-years-old or younger. 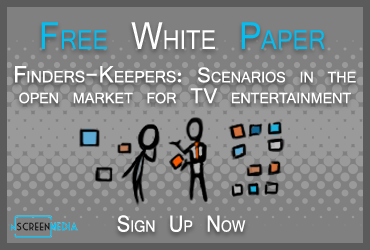 For many young people live and time-shifted TV continues to play an important role in their entertainment lives. However, it would be wrong to say that regular TV dominates their viewing. In fact, for a large group of under-39s digital is equally, if not more, important. For example, a recent survey by Hub Research shows that just 26% of 18-to-34-year-olds consider live TV as their default service. 35% of them say Netflix is their default TV service. The press concluded that live TV still dominates viewing in the US from new Q1 Nielsen data. However, a deeper analysis of the data shows that for the under-34s live TV does not dominate. Half the population of the US is under-38. It is an exaggeration to say that live TV still dominates their lives. Millennials were born between 1980-1996 and are 22-38 today. Baby boomers were born between 1947-1964 and are 54-71 today. This is a big assumption since the time spent on one device impacts the time spent on another. However, doing this gives us a rough idea of the amount of total digital video likely consumed. Nice deep dive on this Colin. Thanks for calling this out. The headlines tell a different story, but it felt a little off. This makes a lot more sense. How about not “approximating” the Baby Boomers to scoop up Gen X’ers? The footnote explaining exact dates that define generations is helpful but we can’t just call anyone over 50 a Baby Boomer anymore because the oldest Gen X’er is now 53. I know that particular generation as a whole is usually ignored but at least give it the dignity of a precise definition. I would have liked to have done that. Unfortunately, the Nielsen data doesn’t quite align as exactly around generations as we both would have liked. I’ll try to look at the Gen Xers in the coming weeks. That said, it will likely be “approximate” due to the Nielsen age ranges.